For no good reason I hadn’t been to Franschhoek for a few years. Now I have one not to return, and another good reason to go back soon. I want to write that I have never seen a place more spoilt by tourism, but of course that is not nearly true; it is just how I feel. You can’t call Franschhoek a village anymore. It is today a strip of boutique shopping malls. At least three more were going up or being renovated as I trundled down the main road – a packaged, touristy wonderland. The place clings to its French heritage. The town celebrates Bastille Day. Many of the names are still French. This used to be quaint. But with the rampant building of artificial-looking galleries and malls, if you didn’t know the history, nowadays the Frenchiness of it has the ring and feel of something recently invented, like a theme park in Japan. Vietnam, the breakaway squatter camp named by residents after its quagmire conditions, which sat next to the main road, was moved some years ago and its denizens resettled. Both sides of the class divide are apparently better off. Despite their near-aristocratic pretentions, the majority of our luxurious wine estates are facing very tough economic challenges, hence the move to tourism and real estate. In the wine heartland more and more vineyards are being ploughed up to make way for property developments that look like a rich person’s version of a slum. These gated, million-rand townhouse complexes – Welgevonden in south Paarl is a prime example – are a real eyesore on the once green, undulating wineland landscape. If it wasn’t the fact that Franschhoek has a disproportionate number of our country’s top restaurants – the like of Le Quartier Francais, La Petite Ferme, Reuben’s and a personal favourite since many years ago, Cabrière’s Cellar Restaurant – I would leave the place to coach tours. The Cellar is literally set into the mountain side. 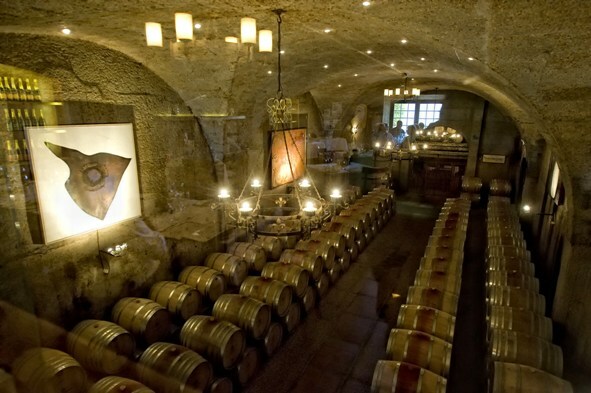 It has a well appointed tasting room and next door to it a dining area with low vaulted ceilings, the walls hung with paintings by cellarmaster Achim Von Arnim and a glass partition that affords views of the wine barrels in the cavern behind. Von Arnim is a pioneer of the Méthode Champenoise in South Africa. In the early 1980s, he planted the Champagne’s classic cultivars of Pinot Noir and Chardonnay. Until then South Africa had only produced carbonated wine. Under the method perfected by Veuve (widow) Cliquot, sediment is first disgorged and then the wine undergoes a second fermentation in the bottle. Due to EU protection laws, wines produced by this method are now labelled method cap classique (MCC). I remember the colourful Von Arnim on his edifying demonstration tours in the late 1980s introducing South Africans to the difference between sparkling and champagne-style wines by popping corks with a cavalry officer’s sabre (one still hangs above the fireplace in the dining room). He was angered when Jacob Zuma (a teetotaller) served imported Dom Pérignon at R1800 a bottle for his inauguration instead of showcasing local MCC wines. Von Arnim’s estate restaurant was also one of the first to construct menus around Cabrière’s wines matching glasses course for course. The helicopter pad on roof of the restaurant is a puzzle at first, until you find out that flying whirlybirds is a hobby of Chef Matthew Gordon. Some may recall his Franschhoek restaurant Le Ballon Rouge which he started in the 1990s. As an aperitif you can’t do much better than a refreshing flute of bone dry Pierre Jourdan Brut Sauvage (R48 a glass; named after the man who founded the farm in 1694). This is one of the best MCCs on the market and it is reasonably priced at R115 per bottle. The service is friendly and prompt, but I’m a little fazed when a passing waitress bumps my elbow and apologises with an affectionate “sorry my baasie”. The gourmet tasting menu is comparably good value for this neck of the woods at R320 per person with wine pairing, R250 without (choosing the same items from the a la carte menu is R265). Gordon has gone for reliable, contemporary-classic dishes. It maybe unadventurous, but they are tasty, achievable and well-judged. We’re into asparagus season and the starter is char-grilled green asparagus with basil pesto, a small poached egg and croutons, paired with a favourite old quaffer, a glass of Haute Cabrière Chardonnay Pinot Noir. The fish course is grilled trout from the Three Streams trout farm in the Franschhoek foothills, garnished with a few dots of trout caviar, and accompanied by a mustard new potato salad and watercress. It is paired with Pierre Jourdan Cuvée Belle Rose, a 100% pinot noir MCC; of the combinations, this is the most outstanding. The main is a garlic-studded roast fillet with mushroom ravioli, slow cooked cherry tomatoes and salsa verde. The gently wooded Haute Cabrière Pinot Noir 2007 harmonizes with the meat flavours, but is perhaps a little light. Summer is also berry season, and dessert is fresh summer berries and smashed meringues with vanilla crème fraîche. Its counterpart is a honey-toned Pierre Jourdan Ratafia – a dessert wine chardonnay fortified with the estate’s own potstill brandy. It is a good reason to return. The coffee is strong and the kind of fortification one needs to depart this sheltered oasis and head back home passing through the tourist maelstrom that is now main road Franschhoek. The Cellar Restaurant, Cabrière Estate, Franschhoek Pass Road, Franschhoek. Tel: 021 876 3688.